Been a frantic few weeks here since we moved and while it's been a half excuse not to sit down and blog, it has not been an excuse to stop me from eating well while getting the new studio space ready to roll. First shoot in the new space started with the lovely and awesome Gina Homolka from Skinnytaste for her second cookbook. Had to pinch myself when I was first approached by her agent to do the photography for this NY Times best seller author but had to pinch myself even harder when I was able to create my own dream team to work on it with me. Prop stylist Kim Phillips and food stylist Tami Hardeman, along with Tami's assistant Abby, joined me on this dream of a week. We have a bit more to shoot in March and April and I can't wait! What's that got to do with eating well amidst busy days? Gina's recipes were all delicious for one, so we did eat very well on our shoot. I have a ton of leftovers from that week in my freezer for two. And third, I've been on a high soup making kick with all the leftover produce in the fridge. And when I was pretty through with those, I turned to a recipe I've been wanting to make for a long time. Taiwanese Beef Soup. The thoughts of soy sauce, chilies, star anise, ginger and beef simmering on the stove for hours was perfect the cold I was starting to develop. After perusing several recipes online, I turned to a friend on Facebook who directed me to one my favorite authors, Andrea Nguyen and her recipe, itself adapted from another one. I followed his advice and used beef shanks with bone marrow and oxtails. I had to adjust the spiciness for my mother in law a little and added in some sliced red chilies separately into our bowls. Everybody was happy and everybody had seconds! 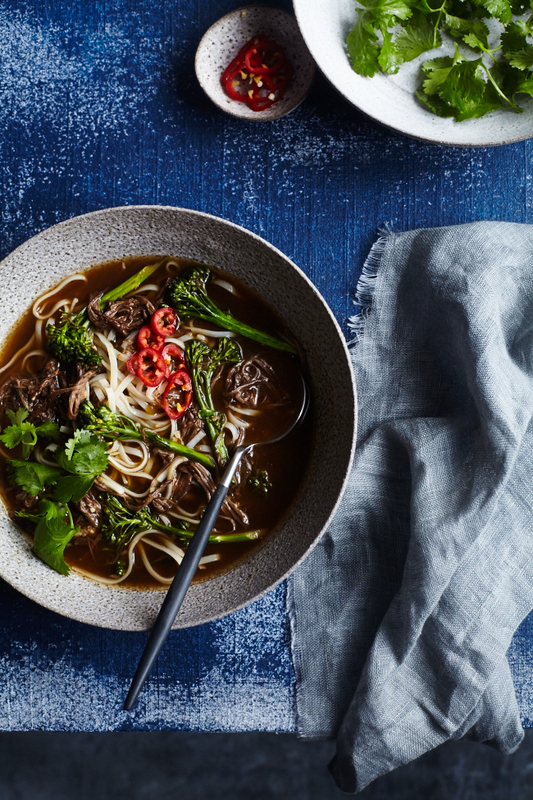 Taiwanese Beef Noodle Soup, adapted from Andrea Nguyen and Lorna Yee. Note: using marrow bones will make the soup a extra rich so I prepare it a day ahead and let the stock refrigerate overnight then the next day I can easily skim off the fat and reheat it for lunch. In a large stock pot, heat half the oil over high heat. Sear half of the beef shanks and oxtails on both sides, about 2 minutes per side. Remove from the pot and repeat with the remaining oil and beef pieces. Add all the remaining soup ingredients, except the broccolini, noodles and cilantro. Bring to a boil then lower the heat to low, cover with the lid askew and cook for about 3 hours or until the beef is tender and falls off the bone. Turn off the heat, and remove the beef pieces with a slotted spoon or a pair of tongues. Let the beef cool then shred it off the bones. Discard the bones. Strain the soup into another pot and put the meat into that pot. Refrigerate overnight. The next day, skim the fat that has risen to the top then reheat the soup on low heat. In the meantime, blanch the broccolini in boiling water for about a minute. Set aside. Cook the noodles according to package instructions. Divide the noodles and broccolini among 6 bowls, laddle soup over noodles and garnish with cilantro and extra chili if desired. yummy in my tummy! I could eat many bowls of that!! Beautiful recipe and pictures. Looks like a great bowl of yumminess for a winter super. Thanks for sharing Helene.